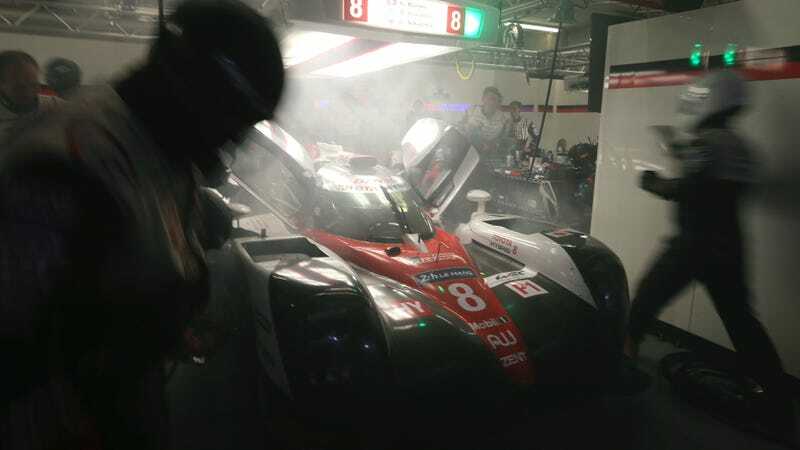 Toyota’s Le Mans prototype team, who previously called hybrid technology “the main reason for Toyota to participate” in the World Endurance Championship, is having to eat those words a bit. Even they told Motorsport.com that hybrid tech in the top LMP1 class at the 24 Hours of Le Mans wasn’t quite ready to race through an entire day at once. This year’s 24 Hours of Le Mans was particularly brutal on its top class. 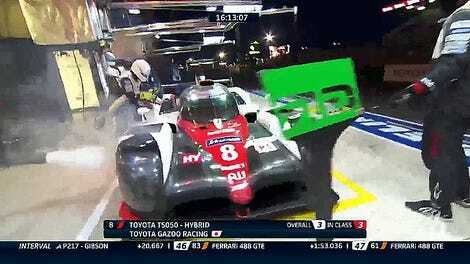 Every single LMP1 car broke during the race. Only two of the five hybrid LMP1s were running at the end, which wasn’t even enough for a full class podium. The two that did—the No. 2 Porsche 919 and the No. 8 Toyota TS050—had to undergo time-sucking hybrid system repairs before they got back out on track. Both Porsche and we, Toyota, were not able to complete without incident 24 hours of driving in the hybrid cars that we put to the challenge on the roads of Le Mans. Both even the winning car #2 and our #8, which completed the race, were forced to undergo time-consuming, trouble-caused repairs, before struggling to cross the finish line. While the hybrid technology that has advanced through competition in the World Endurance Championship puts its abilities on display in six-hour races, it might be that it is not yet ready for the long distance of the 24 Hours of Le Mans. That is particularly harsh coming from Toyota, who pushed so hard for hybrid technology to stay in the revised LMP1 class regulations that they vowed to leave if it wasn’t there, as noted by Autosport. We will hone our technologies even further and ripen them to provide our customers. Now if only the WEC could convince other manufacturers of that so that Toyota isn’t the only team left in LMP1 after this year. Sadly, it’s down to just Porsche and Toyota who are willing to take on the exorbitant cost of developing a hybrid LMP1 car already this year, and many wonder if the hybrid LMP1 class will collapse entirely if Porsche quits. The high cost of entering the manufacturer-backed hybrid LMP1 class is the most frequently cited reason why new marques don’t want to enter LMP1. The future regulations announced before Le Mans have some cost cutting measures, but also emphasize the development of plug-in quick charging systems—which hasn’t been done on a race car before and will no doubt be pricey to get right. So, if hybrid tech isn’t there, as Toyoda notes, despite all the money Toyota and Porsche have spent on it in LMP1, Le Mans’ top class just became a depressingly tough sell to anyone else.